Kara uses the LapBaby to secure her baby while using the Firefly outside. The Firefly, made by Rio Mobility, lifts up the front wheels of a manual wheelchair to transform it to a three-wheeled chair pulled by an electric motor. I’ve had the Firefly for a little over a month. It was a significant investment for our family. I wish insurance would cover products like this. Our decision to purchase was triggered by my loss of mobility following a hip fracture. In the past, I’ve navigated grassy terrain by balancing on my back wheels. I’m not able to go long distances and don’t feel safe going up or down hills. It would also be impossible to hold my infant while balancing. After watching and rewatching review videos, I thought the Firefly might give me the freedom I need. Installation of the Firefly wasn’t easy. There’s a YouTube video available on Rio’s site but I don’t think I would have been able to do it on my own. My husband has tinkered with adjusting the Firefly’s attachment to the narrow and tapered frame of my chair. Once assembled, it’s taken some practice to get the attachment to click onto my chair. I can now do it pretty smoothly-even while wearing my 7 month old. When loading/unloading, I have to dissemble the Firefly to make it as light as possible. The pieces are a little awkward for me but my arm bowing also makes lifting difficult. It’s easier with help but I am able to do it on my own if needed. If I take my time, loading/unloading, attaching, and continuing to wrangle my 3 kids is all possible. The rewards of the Firefly definitely outweight a few challenges with the initial startup. My daughter is playing fall softball. I missed most of her games this spring due to my broken hip. Most of her fields aren’t accessible by sidewalk. The Firefly has made it possible for me to traverse the grassy and sometimes hilly stretches to make it to her games. I’ve also used the Firefly to take my older children on bike rides near our house. It’s quickly become one of our favorite evening routines. I love the option to keep up with them on bike or go off course and explore grassy areas near the woods. away throughout our adventure. It’s not always easy to enjoy the outdoors as a parent with a disability. I sometimes find myself focusing our activities on easier, indoor outings: gymnastics, trips to the library, shopping, etc. These activities are fun but I love the outdoors and I’m thankful that I can now share in the fun as well as make to important events, like games and school field days. Using the Firefly indoors, especially in large spaces, also has its benefits. More on my recent flight with the Firefly in an upcoming blog. I rarely feel an emotional response to a new product but the Firefly is amazing. One of the beautiful parts of the disabled experience is the ongoing opportunity to gain new, unexpected perspectives. I didn’t expect to love crunching over leaves with my 7-year-old this much or riding side-by-side with my son on his bike while he talked about his day. I’m so thankful for another option to try when an outdoor event pops up that I know won’t be fully accessible but I want to attend. Disability often demands multiple adjustments to our changing levels and types of challenges. 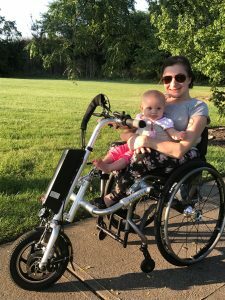 In the last few months, I’ve been frustrated by my loss of mobility and it’s been such a needed boost to experience gains and a new sense of freedom.